It has been a whirlwind of a trip so far! We went to Notre Dame and toured the church, as well as sat across the street in a small café and sipped to the gargoyles and listened to the church bells. Apparently, only one of the original bells is left. We have done a lot of people watching from the street-side cafés. 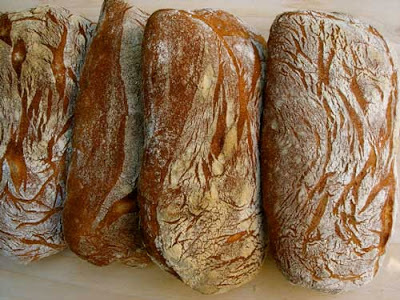 I have gotten tired of baguette and cappuccinos and have switched to ciabatta and caffè macchiatos to mix things up a bit. AMAZING. 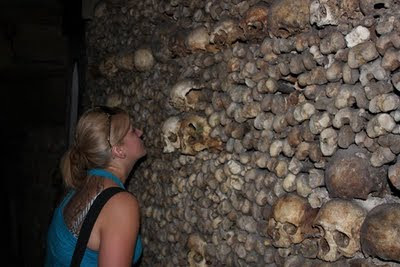 We then moved on to the Catacombs de Paris (a Nikole-driven exploration of death) it was pretty creepy and strange. The catacombs are a series of tunnels underneath Paris that were created by rock removal to create the buildings of France. When the quarries were no longer used, the place became an underground cemetery with an estimated six million people buried in the tunnels. 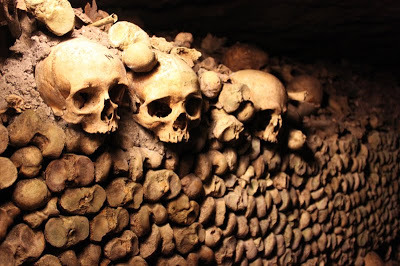 What makes the place creepy is that the majority of the dead arrived here because of a consolidation of cemeteries city-wide of all the bones (for sanitary purposes), and they arrived in stacks; the bones are just piled around, lining the tunnels, sometimes in patterns. Very CREEPY and the walls are slimy and dripping. The place is dark and musty and he floors are slippery. It took an hour to tour the underground tunnels. 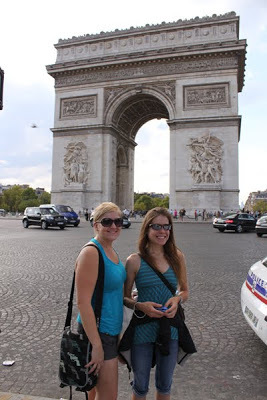 We resurfaced and traveled across the city to the Arc de Triomphe which honors those who fought and died for France in the French Revolutionary and the Napoleonic Wars. The circle around the Arc was crazy with traffic. We sat and watched all the craziness of the drivers and were glad we did not have a car. We walked the entire length of the Champs-Élysées and did more shopping. 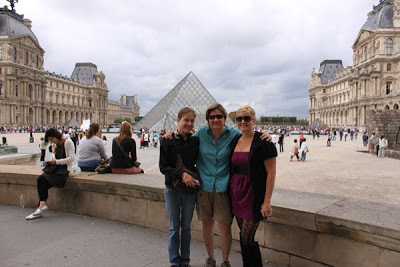 We spent the next day exploring the Musée du Louvre – the most visited art museum in the world and a historic monument. The Lourve was fantastic; we saw Ruben, Rembrandt, Vermeer, Monet, Da Vinci’s Mona Lisa, and the Venus de Milo to name a few. The buildings themselves are amazing and the ceiling paintings alone could keep you very busy. We had a wonderful dinner and walked the city at night. We have managed to do everything on our list. We leave Paris tomorrow morning for the countryside. 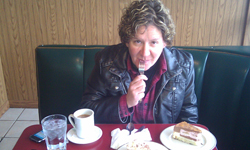 Something unidentifiable on the plate…..
Sweet. I have had very difficult week, and watching your trip unfold virtually has been a pleasant distraction. Thanks.